This is a super cool cooking and serving as you will now open a shop on the top of the skyscrapers in order to serve the superheroes more easily. They love to fly right below the clouds and if they see your pizza restaurant they will surely come and get a bite. They will tell you what they like on the pizza slices and you have to prepare it on the spot, place it in the oven to cook and then serve them. Dont worry about the income as they are well prepared to give you a tip if you do a good job. But dont keep them waiting for too long as they have lives to save. Use the mouse to cook and serve in this management game. 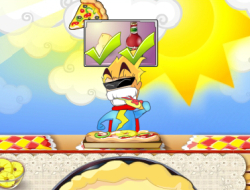 Superhero Pizza 0.00 between 0 and 10 based on 0 votes.